Mexican victory; expulsion of the Spanish colonial government and the signing of the Treaty of Cordoba. Mexico gains independence from Spain. Mexican War of Independence (1810-1821), was an armed conflict between the people of Mexico and Spanish colonial authorities, which started on September 16, 1810. The Mexican War of Independence movement was led by Mexican-born Spaniards, Mestizos, Zambos and Amerindians who sought independence from Spain. It started as an idealistic peasants' rebellion against their colonial masters, but finally ended as an unlikely alliance between "liberales" (liberals), and "conservadores" (conservatives). The struggle for Mexican independence dates back to the conquest of Mexico, when Martín Cortés, son of Hernán Cortés and La Malinche, led a revolt against the Spanish colonial government in order to eliminate the issues of oppression and privileges for the conquistadors. According to some historians, the struggle for Mexican Independence was re-ignited in December 1650 when an Irish adventurer by the name of William Lamport, escaped from the jails of the Inquisition in Mexico, and posted a "Proclamation of Independence from Spain" on the walls of the city. Lamport wanted Mexico to break with Spain, separate church and state and proclaim himself emperor of the Viceroyalty of New Spain. His ambitious idealist movement was soon terminated by the Spanish colonial authorities and Lamport was re-captured and executed for defamation. After the abortive Conspiracy of the Machetes in 1799, the war of Independence led by the Mexican-born Spaniards became a reality. The movement for independence was far from gaining unanimous support among Mexicans, who became divided between independentists, autonomists, and royalists. Lack of a consensus about how an independent Mexico would be governed meant that colonial repression would be replaced by that of elite Mexican rulers. Little changed for the vast majority of the population. The lesson of the Mexican War of Independence is that without a shared vision of how a just and fair government should be structured, a revolution can shed blood and sacrifice lives without actually achieving its goals of freedom, justice and equality. The founder and leader of the Mexican Independence movement was Miguel Hidalgo y Costilla, the criollo Roman Catholic priest from the small town of Dolores. Soon after becoming a priest, Hidalgo y Costilla began to promote the idea of an uprising by criollo, mestizo, zambo, and Amerindian peasants against wealthy Spanish land-owners, and foreign aristocrats. Hidalgo y Costilla would earn the name "The Father of Mexican Independence." During his seven years at Dolores, Hidalgo y Costilla and several educated criollos organized secret discussion groups, where criollos, peninsulares, Amerindians, mestizos, zambos, and mulattos participated. The independence movement was founded over these informal meetings, which was directed against the Spanish colonial government, and foreign rulers of the Viceroyalty of New Spain. 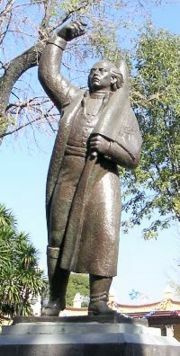 A statue of Miguel Hidalgo y Costilla. After the conspirators were betrayed by a supporter, Hidalgo y Costilla declared war against the colonial government on the late night of September 15, 1810. At dawn of September 16, (the day now considered Mexico's Independence Day) the revolutionary army decided to strike for independence and marched on to Guanajuato, a major colonial mining center governed by Spaniards and criollos. It was on September 16 that the famous "el grito de Dolores" was issued, effectively marking the beginning of the fight for Mexican independence. There the leading citizens barricaded themselves in a warehouse. The rebel army captured the warehouse on September 28, and most of the Spaniards and criziollos were massacred or exiled. On October 30, 1810, Hidalgo y Costilla's army encountered Spanish resistance at the Battle of Monte de las Cruces, fought them and achieved victory. However, the rebel army failed to defeat the large and heavily-armed Spanish army in Mexico City. Rebel survivors of the battle sought refuge in nearby provinces and villages. The insurgent forces planned a defensive strategy at a bridge on the Calderón River, pursued by the Spanish army. In January 1811, Spanish forces fought the Battle of the Bridge of Calderón and defeated the insurgent army, forcing the rebels to flee towards the United States-Mexican border, where they hoped to escape. However they were intercepted by the Spanish army and Hidalgo y Costilla and his remaining soldiers were captured in the state of Jalisco, in the region known as "Los Altos." He faced court trial of the Inquisition and was found guilty of treason. He was executed by firing squad in Chihuahua, on July 31, 1811. His body was mutilated, and his head was displayed in Guanajuato as a warning to rebels. Following the death of Hidalgo y Costilla, the leadership of the revolutionary army was assumed by José María Morelos, also a priest. Under his leadership the cities of Oaxaca and Acapulco were occupied. In 1813, the Congress of Chilpancingo was convened and in November 6 of that year, the Congress signed the first official document of independence, known as the "Solemn Act of the Declaration of Independence of Northern America." It was followed by a long period of war at the Siege of Cuautla. In 1815, Morelos was captured by Spanish colonial authorities and executed for treason in San Cristóbal Ecatepec on December 22. Between 1815 to 1821, most of the fighting by those seeking independence from Spain was done by isolated guerrilla groups. Out of these groups rose two soldiers, Guadalupe Victoria in Puebla and Vicente Guerrero in Oaxaca, both of whom were able to command allegiance and respect from their followers. The Spanish viceroy, however, felt the situation was under control and issued a pardon to every rebel soldier and follower who would surrender. Javier Mina, a Spanish political figure exiled from Spain because of his opposition to King Ferdinand VII's policies, decided Mexico would be the best platform to fight against the king and gathered an army that provoked serious problems to the Viceroy government in 1816. The rebels faced heavy Spanish military resistance. Encouraged by Hidalgo y Costilla and Morelos's irregular armies, the criollo, mestizo, zambo and Amerindian rebels reinforced fears of racial and class warfare, ensuring their grudging acquiescence to the Spanish colonial government, and foreign aristocrats until independence could be achieved. It was at this event that the machinations of a conservative military caudillo coinciding with a successful liberal rebellion in Spain made possible a radical realignment of the independence forces. In what was supposed to be the final Spanish campaign against the revolutionary army in December 1820, the Viceroy of New Spain Juan Ruiz de Apodaca sent an army led by a Spanish criollo officer, Agustín de Iturbide, to defeat Guerrero's army in Oaxaca. 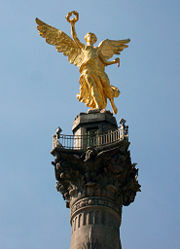 Paseo de la Reforma, "The Monument to Independence" shown here, is also known as "El Angel" (The Angel), which stands at the intersection of Reforma and Tiber and Florencia in Mexico City. Iturbide's campaign to the Oaxacan region coincided with a successful military coup d'état in Spain against the new monarchy of King Ferdinand VII who had returned to power after being imprisoned by Napoleon I of France after he had invaded Spain in 1808. The coup leaders, who had been assembled an expeditionary force to suppress the Mexican independence movements, compelled a reluctant King Ferdinand VII to sign a liberal Spanish constitution. When news of the liberal charter reached Mexico, Iturbide saw in it both a threat to the status quo and an opportunity for the criollos to gain control of Mexico. Ironically, independence was finally achieved when forces in the colonies chose to rise up against a temporarily liberal regime in Spain. After an initial clash with Guerrero's army, Iturbide switched allegiances and invited the rebel leader to meet and discuss principles of a renewed independence struggle. While stationed in the town of Iguala, Iturbide proclaimed three principles, or "guarantees," for Mexico's independence from Spain. The document, known as the Plan de Iguala, declared that Mexico would be independent, its religion is to be Roman Catholicism, and its inhabitants were to be united, without distinction between Mexican and European. It stipulated further that Mexico would become a constitutional monarchy under King Ferdinand VII, he or some Spanish or other European king would occupy the throne in Mexico City, and an interim junta would draw up regulations for the election of deputies to a congress, which would write a constitution for the monarchy. The plan was so broadly based that it pleased both patriots and loyalists. The goal of independence and the protection of Roman Catholicism brought together all factions. Iturbide's army was joined by rebel forces from all over Mexico. When the rebels' victory became certain, the Viceroy of New Spain resigned. On August 24, 1821, representatives of the Spanish crown and Iturbide signed the Treaty of Córdoba, which recognized Mexican independence under the terms of the Plan de Iguala, ending three centuries of Spanish colonial rule. During the struggle for independence, Mexico lost one-tenth of its citizens. In the decade following separation from Spanish rule, Mexico saw a drastic decline in its gross domestic product (GDP), per capital income, and amount of foreign trade. ↑ John Charles Chasteen. 2001, Born in Blood and Fire: A Concise History of Latin America. (New York, NY: W.W. Norton & Co. ISBN 0393050483). ↑ Ryan Dominic Crewe, 2007, "Lamport, William (Guillén Lombardo) (1610-1659)". Irish Migration Studies in Latin America 5(1)(March 2007): 74-76. Retrieved May 20, 2008. ↑ Arthur Howard Noll. 1890, A Short History of Mexico. (Chicago, IL: A.C. McClurg & Co.), 148. ↑ Philip Young. 1850. History of Mexico, Her Civil Wars, and Colonial and Revolutionary Annals. (Cincinnati, OH: J.A. & U.P. James), 84-86. ↑ 9.0 9.1 Noll 1890, 156. ↑ Jim Tuck, Miguel Hidalgo: The Father Who Fathered A Country. Retrieved May 20, 2008. ↑ Jim Tuck, Javier Mina. Retrieved May 20, 2008. ↑ 17.0 17.1 Noll 1890, 171. ↑ Noll 1890, 174, 176-177. ↑ S. Mintz, 2007. Mexican American Voices - The Consequences of Mexican Independence. Digital History. Retrieved May 20, 2008. Chasteen, John Charles. 2001. Born in Blood and Fire: A Concise History of Latin America. New York, NY: W.W. Norton & Co. ISBN 0393050483. Crewe, Ryan Dominic. 2007. "Lamport, William (Guillén Lombardo) (1610-1659)." Irish Migration Studies in Latin America 5(1)(March 2007): 74-76. Retrieved May 20, 2008. Mintz, S. 2007. Mexican American Voices - The Consequences of Mexican Independence. Digital History. Retrieved May 20, 2008. Noll, Arthur Howard. 1890. A Short History of Mexico. Chicago, IL: A.C. McClurg & Co.
Tuck, Jim. Javier Mina. Mexconnect.com. Retrieved May 20, 2008. Tuck, Jim. Miguel Hidalgo: The Father Who Fathered A Country. Mexconnect.com. Retrieved May 18, 2008. Young, Philip. 1850. History of Mexico, Her Civil Wars, and Colonial and Revolutionary Annals. Cincinnati, OH: J.A. & U.P. James. History of "Mexican War of Independence"